Art has a boundless capacity to reflect and influence the way we feel. This autumn, a new exhibition at Sheffield’s Millennium Gallery will present work from some of the UK’s best-loved artists to explore their power to articulate and affect our emotions. Opening on Saturday 20 October 2018, Darkness into Light: The Emotional Power of Art will bring together highlights from three of Britain’s most significant private collections, the Fleming Collection, the Ingram Collection and the Jerwood Collection. The exhibition will feature over 80 paintings, sculptures and works on paper by artists including Elizabeth Blackadder, David Bomberg, Elisabeth Frink, Peter Howson, Chantal Joffe, HaYoung Kim, R.B. Kitaj, C.R.W. Nevinson, Eduardo Paolozzi, Fiona Rae, Eric Ravilious, Anne Redpath, Graham Sutherland and more. In 1951, The Festival of Britain was a beacon of hope, a chance to imagine a future bright with possibility, and brought together artists whose work channelled the unbridled optimism of the age. The following year, the Venice Biennale unveiled new work by some of those same artists, this time embodying the anxieties of post-war Britain and the unease at the burgeoning Cold War. Darkness into Light takes these two key moments as a starting point to explore how, whether filling us with joy or echoing our deepest fears, art can be a profound reminder of what it means to be human. The exhibition will take visitors through a spectrum of emotional states, from fear and anxiety to happiness and serenity. Amongst the works on display in the first part of the exhibition will be C.R.W. 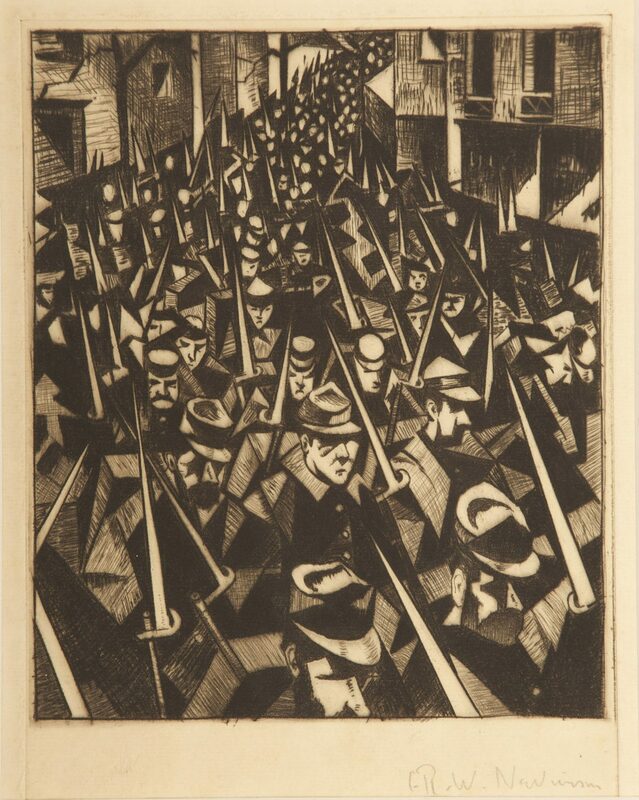 Nevinson’s drypoint etching depicting military activity during the First World War, A Dawn (1916) and Bernard Meadows’ 1962 sculpture, Seated Figure (Cross Legged). Also featured will be R.B Kitaj’s Radiant Turquoise Self-Portrait (2006), and John Watson Nichol’s 1883 painting, Lochaber No More, which shows Scottish emigrants looking back as they leave their home for the final time. The second part of the exhibition will showcase works which represent a sense of joy, optimism and calm. On display will be Dod Proctor’s Lilian (1923), a portrait of a woman in reflective repose, and Anne Redpath’s Window in Menton (1948), depicting the artist’s view out onto the French Riviera town. Visitors will also see Eric Ravilious’ serene Rye Harbour (1938) and Jeffery Camp’s Swimming (1959), showing children and their parents at leisure in Oulton Broad Lido in Suffolk. Darkness into Light is a continuation of the themes explored in Museums Sheffield’s Going Public programme. Established in 2015, the ongoing project investigates how public galleries and private collections can effectively work together to develop meaningful, mutually beneficial relationships. Darkness into Light: The Emotional Power of Art opens at Millennium Gallery, Sheffield, on Saturday 20 October 2018 and continues until 13 January 2019 – entry to the exhibition is free.